Have you decided what you are doing over Labor Day week-end yet? 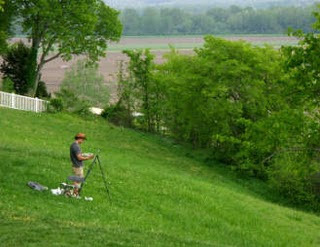 Join our Hermann Missouri bed and breakfast from September 2-5 for the annual gathering of artists for interactive en plein air painting throughout Hermann. What is “en plein air” painting? It’s a venue for artisits who paint from life on location. We have a beautiful town, gorgeous scenery and you will most definitely have a great time. Time: Friday, Saturday 9 a.m.-5 p.m., Sunday 10 a.m. – 4 p.m., Monday 9 a.m.-noon.